I am loving clutches lately. I don't know if it's size that forces me to carry only the essentially (cell phone, cash, ID, debit card & gloss) or how it can just pull an outfit together... regardless I'm a wee bit obessed lately. Below are a few of my favorites I've found online. The first two are seriously divine. For the every day or the special occasion, these bags are fab! 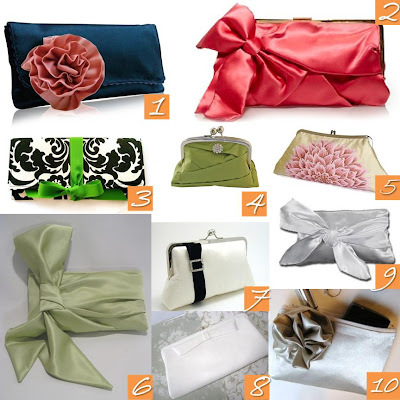 It's my wife's website for fashion bags, and of course (as the name implies), clutches! Love these clutches!! I didn't realize the JCrew bag (#2) came in that shade...love it! p.s. I am a northern KY blogging bride and it great to find your blog! !